Grillz for your Top & Bottom Teeth You are checking out one of our Grillz combos, the gold tone Hip Hop Grillz with the new and improved silicone fitting piece for added comfort. This grill is constructed from a high quality solid brass core and heavily plated rhodium finish to give this grille a brilliant shine. Each high quality fake diamond is hand glued into the hiphop grillz for maximum bling. Each grille can fit any teeth no matter how straight or crooked your tooth is. Thanks to our special custom fitting silicone mold mouth piece there is no need to send a mold back and forth through the mail. Easy to follow instructions are included to wear your mouth grillz in minutes! The good thing about these grills is that they are removable, you can wear the grill or remove it easily. Grillz come in a nice box to store in. 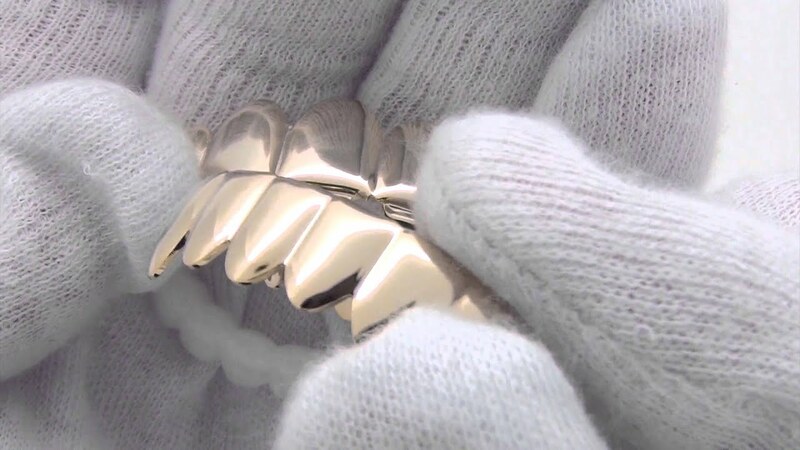 **Disclaimer** These grillz are intended for decoration and entertainment purpose only. The grillz are not intended for eating. These products are sold as it is without warranties of any kind. Due to the nature of this product, no returns or exchanges are allowed so please be aware of that prior to ordering. We will not be liable for any damages of any kind arising from the use of these grillz including but not limited to incidental, punitive or accidental damages.